Best Video Transfer Services in Manhattan, NYC, NY. Video to Digital conversion in NYC. Video to DVD, Video Tape to Digital in New York. PAL (European) to NTSC (USA) conversion. How long does it take to copy video to DVD? - single tape could be ready as early as next day. Video Transfer Services Q & A - Store info, How to Edit DVD, Private Tape to DVD, etc. We understand the importance of your Video tapes. It's simply irreplaceable. All Video copy work done in house at our NYC studio. No tape will be sent out for audio and video digital conversion! Zero chance of your precious tapes lost by outsourced. Your Video tapes stay with us all the time here in New York City Lab. Your tapes are getting disappearing day by day. Soon or later you've got to digitize it - sooner is better! Digitize them today for your archive. If you prefer computer digital movie file than DVD video disc- please see here. Video transfer services at our Manhattan, NYC lab. Your tapes stay at our New York Lab throughout the process. Quick turnaround time (same day or next day transfers will be available). Privacy kept tight. See our Confidentiality / Non-Disclosure Agreement. State of the art Equipment and Professional DVD media. Video to DVD Transfer, NYC, NY. Our price is very simple and straightforward. All inclusive except tax. No Scanning fee or Transfer fee or Output fee nor Media fee or etc. American TV system (called NTSC) tapes only - PAL tapes are different prices. Tapes must be in NTSC (USA TV system), not in PAL (Europe, Asia or Africa) or SECAM TV system. You can combine different video tape types to get the quantity discounts. VHS, VHS-C, 8mm (Video8, Hi8 & Digital8) and mini DV tapes can be combined to get the discounts. No other tapes, such as Standard size DV cam tape, 3/4 inch U-matic, 1/2 inch BetaSP, BetaMax, HD (High Def), Micro MV tape nor PAL tapes can be combined (regular prices apply). One tape to one DVD video disc each transfer only. The discount prices are based on one tape to one DVD each basis. the price is $29.95 per NTSC tape and $39.95 per original PAL tape. But it still make sense when you're planning to make multiple DVD copies afterward. The whole tape will go on to a DVD disc. No video editing, such as a portion of a tape transfers. MOV(Quick Time), WMV, AVI, MP4 or any other digital format are $29.95 each. Each tape must be less than 4 hours. A longer than 4 hours tape will be transferred to two DVDs, and the price is double. A half deposit required for an order over $50.00. This does not apply to Send-in orders (by FedEx, messenger service or Mail). Let's say you have 3 of 30 minutes tapes. With one tape to one DVD method, we can use 3 systems simultaneously, therefore all work will be done within an hour or so. If we have to put 3 tapes to a DVD, we have to wait till the first tape is converted to the DVD, then start the next one and so on and on. It takes much longer and need more care, therefore gets expensive. DVD video disc means, a DVD disc that will play on DVD players (and PC or Mac with DVD drive). A data DVD disc (a DVD disc with MOV or other files or data) is not a DVD video therefore it will not play on DVD players. 1. Leave Doi Camera and its affiliates free from copyright violations. 2. You shall indemnify and hold Doi Camera and its affiliates against any claim, damage, loss, liability or expense arising out of, relating to or in connection with the copyright issue of your item(s). A VHS tape DVD or VHS-C tape to DVD transfer is $19.95 per tape. Video tape conversions will be processed at our studio here in Manhattan, New York City. Your tape will stay with us from the beginning to the end of digital video conversion process. Turnaround time is very quick. Please see here. We will fix broken video tape, as long as the tape is salvageable. 1. We only work on VHS tape, 8mm tape, DV tapes (not audio cassette tape). 2. The fixed tape must be transferred to DVD video (we don't offer tape repair only service). 3. Price is $15.00 per tape, on top of transferring fee. An 8mm, Hi 8 & Digital 8 tape to a DVD transfer is $19.95 per tape. No DVD player? You want a digital file from 8mm tape? No Problem. No DVD player? You want a digital file from DVC tape? No Problem. Mini DV tape in DVCam format - price is different, see here. Mini DV tape in DVC pro format - we don't process. NTSC DV tapes in HD - we can process 60i, 24F(P) and 30F(P) - to regular DVD disc. PAL DV tapes in HD - we only process 50i, no Progressive 24F(P) nor 30F(P) - the price is different. Methods we use to transfer your DV tape to DVD disc. With standard definition mini DV or DV Cam tapes to DVD transfer, we will use DV cable(= iLink) transfer method. Unlike the old AV cable analog transfer method, this is the very best quality DV tape to DVD transfer method you can expect. With this method, the digital data on a tape will be transferred to DVD in its original digital format. For HD DV tape, we will encode it to standard DVD, so you can play on a regular DVD player as well as PC/Mac computers. Min and Standard DV Cam tape recorded in DVCam format to DVD transfer is $29.95 each. We convert DV Cam tape to DVD, but are not handling DVC Pro tapes. (There are three different recording systems on mini DV tape). Micro MV tape was the smallest video cassette tape ever, it is smaller than Mini DV tape. 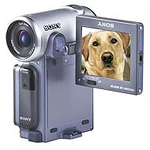 Micro MV camcorders were in production by Sony from 2001 through 2005. There are no quantity discounts available due to our limited production capability. NTSC Micro MV tape only. We are unable to transfer PAL Micro MV tapes. $39.95 each for MP4 file. NTSC (USA BetaSP tape) only. NTSC (USA U-Matic tape) only. U-Matic Tape is also called 3/4 inch tape or 'three-quarter-inch' tape. $49.95 each for MP4 file. best quality digital conversion. Takes about 2 weeks. Convert Video tape to MP4 or other Digital Files in NYC. Convert Video tape to digital file so you can view or edit on computers. Transfer Digitize video tape to MP4 or other digital video format. Convert PAL tape to Digital file such as MP4 or other digital video format. VHS, VHS-C, 8mm, Hi8, D8, mini DV - $29.95 per tape (up to 2 hours). BetaSP, BetaMax, Full size DV tape - $39.95 per tape(up to 2 hours). 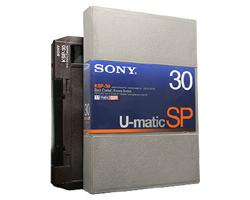 U-matic(3/4" tape) - $49.95 per tape. 1. A longer than 2 hours tape will be charged additional $29.95 per two hours. 2. Digital Video Files will be saved to disc (CD or DVD) or external hard drive. Please provide your hard drive if you want us to save MP4 or MOV files to hard drive (please see here for more details). Because of the security reason, we don't save MP4 or MOV files to your USB thumb drive. We are not offering Apple Prores4.2.2 or Uncompressed digital files. We are not offering HD size (1920 x 1080) MOV files. All High Def video (1920 x 1080) will be down converted to 720 x 480 file size. 4. We don't send video files via E-mail or uploading to Website such as YouTube, Facebook, DropBox, FTP or iCloud. How to choose best digital video file format for your project. This video will help you understand basics of digital movie files. The "digital video file" is not one and only. Some digital video files don't work on Mac computer, some work good on Mac, but don't work on Windows. Some files are designed for iDevice, Smart phones and Web sharing such as Facebook or Youtube..
and some are too small for editing. So it's important to know the best digital video file format for your project. 1st If you want to play the video on DVD player to enjoy on TV, you have no other choice but DVD video. You can Edit the DVD by Ripping the DVD. How to rip DVD video is here. 2nd If your purpose is Web-sharing such as Facebook, YouTube, DropBox and so on - MP4. If you want to view on iDevices, smart phone or Tablet - MP4. Mac computer users to view with Quick Time Player or edit with iMovie - Quick Time (.MOV) file. edit with Windows Movie Maker - Windows Movie Video(.WMV ) file. uncompressed ProRess4.2.2.. or uncompressed DV file. We are NOT offering these files. If you have a Hi Def tape, we can only offer SD file size in 720 x 480 only. Play on PC or Mac? * MOV = Quick Time file. Will play on Windows PC with Quick Time Player for Windows. Convert video tape to Digital file for viewing on PC, Mac, iDevice, tablet or smart phone. iMovie, FCP, Adobe Premiere or Windows Movie Maker. We are offering Quick time (.MOV) in H.264, MP4, WMV or AVI (Xvid or Divx) in standard frame size format. We are not offering digital files in Hi Def files (1080P or 720P), ProRes4.2.2 or Uncompressed DV files. There is no such file format that will play on DVD player and is editable on computers, at the same time. If there is, then you can edit (change) the DVD movie story - Disney will not like it. For Windows (XP, Vista, W7 & W8). we recommend WMV over a very old format of AVI. Windows users might need "Quick Time Player for Windows" (free from Apple) to play Quick Time (MOV) or MP4. We will save digital movie files to CD or DVD disc. Although the files may be written on a DVD disc, that DVD is a "Data DVD Disc", not "DVD video". Instead of CD or DVD disc, we can save to your external hard drive, too. The external hard drive must be empty and formatted in either NTFS, exFAT or Mac. FAT32 format will not be accepted, because it cannot handle a file larger than 4 GB. WE ARE ABSOLUTELY NOT RESPONSIBLE FOR THE DATA LEFT ON THE HARD DRIVE. Please format or empty out the hard drive before bring it to us. HD tape will be down convert to standard file format of 720 x 480 or 640 x 480. We are not offering MOV, WMV, AVI or MP4 in HD (1920 x 1080) file size. 6. We don't handle DVC Pro tapes. There are many types of digital movie files to choose from. Click here to lean how to choose best digital movie file for your project. How to watch DVD video on iPhone, iPad and other personal devices. A good article to read is here. PAL(European) Tape to NTSC(American) DVD conversion in NYC. If you have an European tape, Russian tape, African tape or South American tape, and want to make a DVD that will play here in the US, the tape must be changed from PAL or SECAM to NTSC TV(American) system. This NTSC DVD will play on American DVD players, as well as on PC, Mac computers with DVD device. PAL VHS tape and PAL VHS-C tape. PAL mini DV tape, PAL DV Cam tape. PAL 8mm tape, PAL Hi8 mm tape, PAL Digital8 tape. PAL U-matic, PAL Betamax, PAL BetaSP etc. We can convert PAL Hi Def. DV tape in 50i to standard NTSC DVD. We are unable to handle PAL Hi Def. tape in 24P(=24F), 30P(=30F), 720P or DVC Pro HD formats. The turn around time is very quick because our Video tape conversions are processed at our studio here in Manhattan, New York City. Your tape will stay with us throughout the video conversion process. Normally a PAL to NTSC conversions could be done in a day or two. Multiple tapes or a long duration tape may take longer. Copy PAL tape to PAL DVD - please see here. PAL VHS tape and SECAM VHS tape to NTSC DVD conversion. $29.95 for up to 4 hours original PAL tape. $49.95 for a longer than 4 hour PAL tape or SECAM tape ( a set of two DVDs). PAL mini DV tape to NTSC DVD transfer. $29.95 per original PAL tape. We can convert all Standard Def recorded tapes (SD mode) mini DV and standard DV tapes to NTSC. PAL 8mm, PAL Hi8 and PAL Digital 8 tape to NTSC DVD conversion. Convert PAL tape to Digital file. Change PAL tapes to computer file - please see here for details. Please see what file formats we do - here. $29.95 per original PAL tape up to 4 hours. We convert PAL DVD to NTSC DVD, that will play on American DVD player. $29.95 per original PAL DVD. WE DO NOT HANDLE ANY COPY RIGHTED DVDs. The NTSC DVD we create is free from regional restrictions. we are unable to re-create the whole DVD construction. All we can do, is to convert the main movie with a single language with or without single subtitle into NTSC format. the NTSC (American) tape has to be converted to a PAL DVD. Normally a NTSC to PAL conversions could be done in a day or two. $29.95 per original NTSC tape. A longer than 4 hours NTSC tape will be $49.95 for a set of 2 PAL DVDs. what you need is a PAL (European TV standard) DVD from NTSC(American TV standard) tape. Longer than 4 hour tape subject to $19.95 additional for an extra DVD. $29.95 per original NTSC tape up to 4 hours. A longer than 4 hours NTSC tape will be transferred to a set of two PAL tapes at $49.90. $29.95 per original NTSC DVD. We convert US DVD (NTSC DVD) to PAL DVD, that you can play in Europe. The PAL DVD we create is free from regional restrictions. we are unable to re-create the whole DVD construction in PAL. Convert PAL tape to PAL Digital file. We can convert PAL Hi Def. DV tape in 50i to standard PAL DVD. 9.95 per DVD in either paper or plastic case. Quantity discount available. Ask us. DVD copy will be processed at our studio here in Manhattan, New York City, so the turn around time is very quick. We might make small quantity DVD or CD copies while you wait, if there is no printing on discs required. A 100 disc copy will be read in a day or two. Unless the DVD is not finalized, it cannot be played on other players except the camcorder that was recorded. Not finalized DVD will not play on our DVD player either therefore we are unable to make copies. We cannot finalize your mini DVD here. It must be done in your camcorder. Please refer your manual and lean how to Finalize your disc in the camcorder. 1) One-by-one copy only - no multiple mini DVDs to a single regular DVD. 2) Takes a couple of hours to a day to make mini DVD to regular DVD copies. What does "Finalize mini DVD" mean? To play a DVD video disc, a DVD player(or PC/Mac) has to go to "index section" on the disc to know what contents are on the disc, where to start, where to end, how many chapters or how to show menu screen. When you were recording videos, the disc is still "Open" and ready for next recording. You have to let the camcorder know that you are done on the disc so that the camcorder can create the index section and write it to the mini DVD. In other word, until you let the mini DVD know "I'm done", the mini DVD is open-ended and not playable, because the index section is not there yet. This process(letting the mini DVD disc know that you are done and no more recording will be coming, so please create an index section on the disc) is called finalized. DVD to MP3 (DVD Audio to MP3). Convert DVD to MP3, Convert Video to MP3. Under no circumstances, we will make soundtrack CD from commercially made DVD video. We will make an audio CD (or MP3 files on a CD) from your DVD video. In other word, we will take out audio part from your DVD video and make a music CD. DVD to MP3 is a good idea for listening to a video taped lecture, party, wedding, class, meeting or testimony. Audio CD can be played on boom box, CD player or PC/Mac computer. The MP3 files can be listened to on iPod, iPhone or other MP3 players. Price is $29.95 per DVD. Doi Camera is not responsible for any material left over 14 business days. All the prices quoted are subject change without notice..